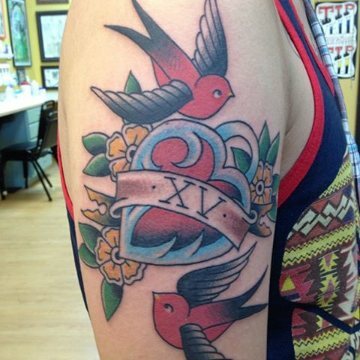 Here at Virtue Tattoo we offer all types of top quality tattooing! All styles are available...tribal, american traditional, japanese, lettering, realism, whatever your preference may be, we can do it. Come by with a design in mind, or let us help you chose a design that best suits your needs. We can draw you anything your mind can think up! Walk ins are welcome, appointments are nice if you have a set schedule. Appointments are made in the shop and we require a $50 deposit. The deposit will come off the price of your tattoo at completion. Our shop minimum is $60 and our hourly rate (for large pieces only) is $150 per hour. If you like a specific artists work and would like to be tattooed by them, shoot em an email or call the shop for more information. We are happy to help you with any questions/concerns. Thank you for visiting our website! We look forward to seeing you in the shop! Body piercing at Virtue Tattoo is performed in a private piercing room, as to make the experience more relaxing and efficient. The body piercers have at least 17 years experience each. They continue their education constantly to ensure that they are up to date on all techniques and safety standards. We carry a large selection of high quality implant grade body piercing jewelry that ensures not only a happy piercing, but also a variety of options for each piercing we perform. At Virtue Tattoo we not only carry steel and titanium but also stock gold body piercing jewelry as well. We also have quite the selection of body jewelry with gems. 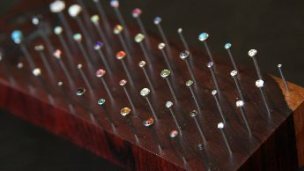 They range from natural stones such as jade, turquoise, amethyst and opal, Swarovski Crystals in over 20 shades, synthetic opals in over 10 shades, real diamonds, and many other options. All gemstones are Guaranteed to stay in there setting or it will be replaced at no charge. In addition we can always special order a piece of body piercing jewelry at no additional charge. Body piercing starts at $40 with a basic captive bead ring or $50 with a basic internally threaded barbell. Our Piercer is available Tuesday through Saturday.